In my quest to find inspiration by resuming participation in food blogging events I thought it seemed only fitting that I partake in one being hosted by Meeta of What’s For Lunch, Honey? Her Monthly Mingle was the first blogging event that I ever entered and when I saw that the theme for this month was Caribbean Cooking, I decided I should definitely be able to figure out something to make for it. When I think of the Caribbean the first thing that comes to mind is Cuba. Cuba, si! It’s the only place I’ve been in the Caribbean and I’ve been three times. Although I can’t believe over two years have passed since I was there last, (and according to that post, over two years since I started baking from Dorie’s book!). I need to go back. I need to feel that soft white sand between my toes and sip on a mojito, or perhaps a Cuba Libre at inappropriately early times of day, (ie- 10am). I need to spend some time walking the beach, floating in the ocean, playing a little volleyball and then returning to my room to find swans made of towels. What else do I need? Tropical fruit! And that’s where the Monthly Mingle comes in. Despite the fact that I dislike pineapple upside down cake, I love pineapple, particularly fresh pineapple. Ideally I would eat all my pineapple fresh from the tree, but given that I live in cold and snowy Canada and it’s still the middle of winter here, that’s not going to happen. What that means is that by the time a pineapple has travelled from the tropics to my house, it’s likely not at the pinnacle of ripeness. Fortunately, it can still be salvaged with the addition of sugar, dark rum and roasting. While we’re at it, let’s throw in some more tropical flavours with coconut and bananas. What do you get? 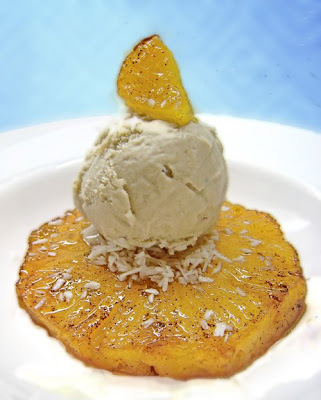 Roasted Pineapple with Coconut and Banana Ice Cream. It’s as close as I’m going to get to the Caribbean anytime soon and it’s delicious! Preheat oven to 375°F. Place sugar, rum and allspice in a bowl and stir together. Toss pineapple slices in mixture and lay into a 9" by 13" baking pan. Pour the remaining syrup overtop. Roast for 1 hour, or until pineapple is caramelized and tender, flipping half way through. When pineapple is completely tender sprinkle a little extra sugar on top and stick under the broiler to caramelize. 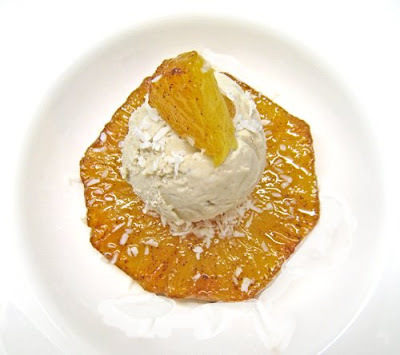 Put a slice of pineapple into a bowl, sprinkle some coconut onto the middle and top with a scoop of banana ice cream. Serve immediately. Posted by Brilynn at 11:48 p.m.
Bril, you do not know how happy I am to see you back at my mingle. I've missed you! and you see why don't you? exactly for these tantalizings creations! me and you - together we could eat a world full of oce cream! Carribean flavors are the best, coconut, rum and pineapple you cannot go wrong. 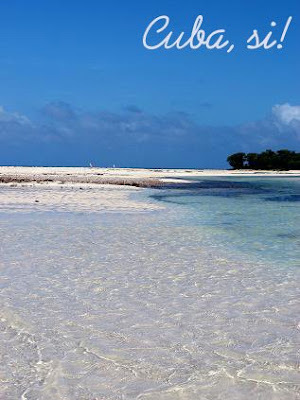 I've never been to Cuba, but the carribbean right now sounds fantastic! I love the pineapple dish! This looks fantastic -- I love pineapple too! I can't wait to try this! That sounds fantastic! I love tropical fruit and wish I were a little closer to the source, too. Fresh pineapple is one of the most amazing things EVER. This sounds so tropical and makes me want to be on a beach somewhere! I must give it a try. This sounds like the perfect dessert to me! Love that beach photo too! What kind of ice cream maker do you have? ARe you happy with it? You know you're always welcome at Blog Party...and this month we're having Brunch..?! Your post made me warm for about two seconds, thanks! We still have snow! The pineapple looks terrific! Pineapple is currently in season down here right now. Bought 2 large ones over the weekend. the shine on that pineapple...! i've been on a pineapple kick lately, but i never thought about roasting it! yum!